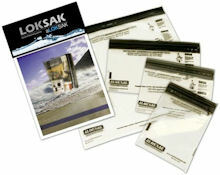 LOKSAK makes better resealable plastic bags -- in a variety of sizes to protect your important papers and valuable electronics from dirt and dust, sand and salt, water and humidity (see earlier post). These are heavier weight and more rugged than grocery store plastic bags, with a hermetic seal so you can take your camera phone underwater or even use them to store food and contain odors. And you can still use the touchscreen on the Apple iPhone or other devices while they are protected. The bags now come in some 13 sizes, from 3.37 x 6.37 to 31.5 x 16.5 inches, to store wallets and passports and books and maps to smartphones and mini and full-size tablets. Prices start around $7 for three-packs of the smaller bags, to $18 for two-packs of the larger bags. There's also the SHIELDSAK, a lightweight, fabric Faraday pouch that blocks wireless signals that can access your information.from mobile devices, passports, and credit cards. This was originally designed for the U.S. Military, and blocks Radio Frequency (RF), Infrared, and Skim/Quick Scan Technology. The SHIELDSAK feels like a soft fabric and is a neutral gray/brown in color. 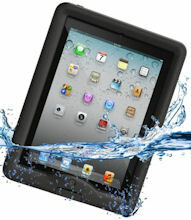 It's secured with a top velcro enclosure, plus an additional fold-down velcro strip. The model for phones is around $64 (4.5 x 5.5 inches), and the larger model for tablets is $149. This is a nice solution if you want to totally disable a cell phone, or don't like the idea of walking around abroad with the new U.S. passports that feature the RFID chip that allows a wireless scanner to read out your personal information. 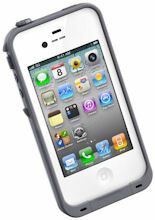 Lifeproof has updated its line of protective cases (see earlier post) by bringing its screenless design to smartphones. The idea with the nüüd case design, as with the iPad tablet case, is to not use a screen cover, but to still wrap the rest of the device. By sealing from from the edges of the screen, the case is fully protective -- water proof, dirt proof, snow proof and shock proof. This design depends on the toughness of today's screens to handle the wear of daily usage. But you get direct touch access to the device's screen, with no visual interference or glare. There still can be a need for the original frē case if you're in rougher environments, since it includes a screen protector to take the scratches and gouges that would otherwise reach the glass of the screen. Lifeproof has the original frē cases available for smartphones to the iPad mini, including the iPhone 5 & 4/4S, iPod Touch gen 4, and Galaxy SIII. 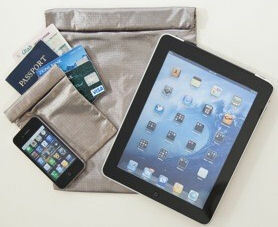 The screenless nüüd design is available for the iPad and now the iPhone 5 and Galaxy SIII. Prices range from $79 / $89 for the iPhone 5 frē and nüüd, to $99 for iPad mini frē, to $129 for the iPad nüüd. Many of these are available in at least back and white, and the iPhone 5 frē is now available in a range of some 10 bright and subdued colors, depending on whether you want to stand out or blend in. There are also a variety of accessories for supporting your device during strenuous activities, including a belt clip, armband, car mount, bike mount, and the Lifejacket floating outer case. These are stellar protective cases that are still impressively thin and light. I've used them successfully on the east coast in rain and snow and along the beach, and out west in heat and dirt and dust. Then in normal use, they don't get in the way by adding substantial bulk or distance from the touchscreen. The result is a strong level of comfort that you don't have to worry about your device when you have other things to be doing. Portable storage devices are quite useful for, of course, storage -- to carry along your collections of data files and playable media. And they're also rather useful for sharing -- both for allowing others to access and enjoy your collections, and for simply transferring some files between different devices. You can share and transfer using wireless networking -- by e-mail if needed, or via a local wireless bridge device (see earlier post) -- but sometimes using plain old-fashioned physical media is the simplest and most reliable approach. However, physical media comes in different form factors and uses different connections, depending on your device -- tiny microSD cards for pocket devices including smartphones and tablets (except the iPhone and iPad with no memory card slot), larger SD cards for more substantial cameras and camcorders, and USB sticks for laptops and computers. So you'll need to carry three different types of storage media, which don't transfer cleanly between different devices. 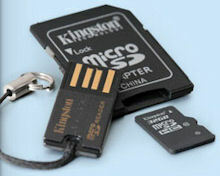 A better answer is to take advantage of the small size of the microSD card as a common storage media, and then use adapters to fit it into the SD card and USB stick formats -- as in the Kingston microSD Mobility Kit. Even better, storage is ridiculously inexpensive these days -- You can get the Kingston Mobility Kit with a 32 GB card and the two adapters for around $23 (street), and the faster Class 10 version for around $32. So now you can carry massive amounts of storage for your digital files on microSD (32 GB is double the capacity of the iPhone 4S, for example), plus use the Mobility Kit adapters to share between your devices and with friends and colleagues. It's a simple and straight-forward solution. Wireless storage devices like the Maxell AirStash Wireless Flash Drive (see earlier post) are a new and tremendously useful category of gadget for our phones and tablets. We have lots of digital files that have been collected over time -- data and media -- and we don't necessarily want to be concerned with syncing all this stuff among all our devices, or filling up all the memory in our phones. But sometimes it's useful to have our favorite files along -- to enjoy on trips, for example -- and it's also helpful to be able to easily share and transfer files with other mobile devices. The Kingston MobileLite Wireless provides a complete answer for wireless sharing between mobile devices and portable storage in a package a bit larger then the mini AirStash. - It has both a USB and SD port, so it can serve as a hub for both USB flash drives and SD cards. - It serves as a Wi-Fi hub, so you can connect to it from up to three different devices simultaneously. And you can configure it to bridge through to your existing Wi-Fi hub, so you can remain connected to the Internet while sharing files. - Finally, as a bonus, you even can use it as a portable battery to charge your phone. But beyond the interfaces and connectivity, the real success of these devices depends on the software. And the MobileLite Wireless app (for iOS and Android) really shines, with a straightforward interface, consistent and complete functionality, and strong integration with operating system (including multitasking to run with other apps). You can browse files and folders on your device and the attached USB / SD storage, and directly view photos, music, and video. It has complete support for transferring files between the local device and the wireless storage, to copy or move, delete or rename. And within your device, you can transfer photos from / to the iOS Camera Roll, and use Open in to bring files from/to other apps. The Kingston MobileLite Wireless is about the size of a small phone at 4 7/8 x 2 1/4 x 5/8 inches, very light at 3 1/2 oz., and is available for $59. The key to constructing complex and interesting things is to take advantage of modularity -- as with walls and doors and windows in construction, objects and routines in programming, or dedicated circuits in electronic devices. For one example, Lego blocks use the classic interlocking brick design to provide simple and consistent connections for building and combining modules. And the Logo programming language simplifies learning to program through simple but powerful functions (especially for drawing), combined through small procedural modules. But even with well-defined modules, trying to get started experimenting and playing in a new area still can be overwhelmingly complicated and confusing -- both in understanding the components, and in the details of how to connect them together. Which is why the littleBits electronic modules are such a clever approach for helping people to experiment and learn and play with electronics -- You can assemble electronic projects simply by snapping together small modules. You can have fun quickly making basic designs like buzzers and blinking lights, or check out the littleBits website for a wide range of project ideas from littleBits and its users. You can quickly snap together a simple light or buzzer, step up to a fun project like a flickering lantern, or interactive card, or move on to a more ambitious project like a motion-based sound generator or simulator for phases of the moon. What makes littleBits so friendly is that there's no soldering, no wire-wrapping, no stripping wires -- While all of these can be can be fun for enthusiasts, they can be rather off-putting for kids and even grown-ups that just want to get started quickly. Instead, each littleBits Bit (individual module) is typically a small 1-inch circuit board with brightly-colored plastic ends. The modules snap together magnetically, so there's no fuss, no way to mess up the hook-up. Start with a Power Bit (blue) at the beginning of the chain to supply power to the rest of the modules. To control the action, add Input Bits (pink) with buttons, switches, and sensors. The touch controls include a button, dimmer, pulse, toggle, roller, and slider. The sensors include light, motion, and sound triggers. Then to make stuff happen, add Output Bits (green) for light, sound, and motion. These include LED lights such as color, bargraph, and uv, and actions from vibration, motor, buzzer, and fan. You also can add Wire Bits (orange) to make more interesting creations by separating power and communication between Input and Output Bits. These also include an inverter to reverse signals and logic Bits that take multiple inputs. Even better, if you want to dive deeper into electronics, littleBits is an open source project, so you can download detailed circuit diagrams of the modules. You can get going with the littleBits world with kits and bundles, including the Starter Kit with 10 bits for $89 (shown above) and the Extended Kit with 16 bits for $149. There also are Booster Packs for touch controls, lights, or sensors for $49, or you can get individual bits starting at $14. Plus - littleBits also is offering a discount code for $10 off to Manifest-Tech readers through 9/15/13 -- use http://bit.ly/12r706M. Entries posted to Manifest Tech Blog in July 2013, listed from oldest to newest.